Huge thank you to Booths customers for their donations! Yesterday a team of our volunteers shook buckets in Knutsford’s Booths supermarket. The Christmas spirit was in full bloom and we received donations in the region of £520! This is a great boost to us and we send our ‘heart’felt thanks to all who donated. Your money will go towards our various initiatives in Knutsford in the coming year. 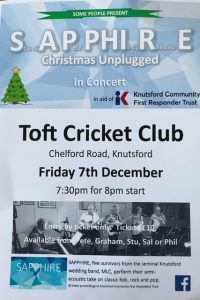 Our next fundraising event is tonight where have SAPPHIRE playing live at Toft Cricket Club! ‹ Support us by spending a lovely evening with great tunes!